Today, repository management services are key components of collaborative software development. They enable software developers to manages changes to the source code and related files, create and maintain multiple versions in one central place. There are numerous benefits of using them, even if you work in a small team or you are a one man army. Using repository management services enables teams to move faster and preserve efficiency as they scale up. In this article we briefly introduce and compare four popular repository management services GitHub, Bitbucket, GitLab, and Coding by touching on multiple aspects including basic features, relationship to open source, importing repositories, free plans, cloud-hosted plans, and self-hosted plans. The purpose of this article is not to swing opinions, but serve as a starting point for your research when you are looking for the best solution for your project. GitHub is Git based repository hosting platform which was originally launched in 2008 by Tom Preston-Werner, Chris Wanstrath, and PJ Hyatt. This is the largest repository host with more than 38+ million projects. Bitbucket was also launched in 2008 by an Australian startup, originally only supporting Mercurial projects. In 2010 Bitbucket was acquired by Atlassian and from 2011 it also started to support Git hosting, which is now its main focus. It integrates smoothly with other services from Atlassian and their main market is large enterprises. GitLab started as a project by Dmitriy Zaporozhets and Valery Sizov providing an alternative to the available repository management solutions in 2011. In 2012 the site GitLab.com was launched, but the company was only incorporated in 2014. Coding was founded by Zhang Hai Long (张海龙) in Shenzhen, China in 2014 and received $15 million funding in the same year. Coding is currently used by 300 000 developers and hosts 500 000 projects. Their user base is rapidly growing on the mainland Chinese market and they have already set their eyes on international users. For more details please visit the feature pages of Bitbucket, GitHub, GitLab, and Coding. Which one is open source? 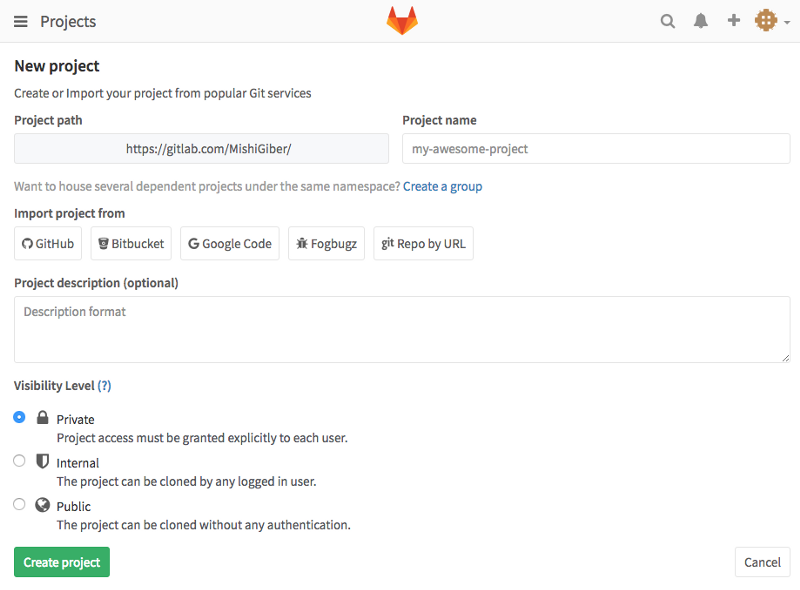 From the four repository management services, only GitLab has an open source version. The source code of GitLab Community Edition is available on their website, the Enterprise edition is proprietary. GitHub, who is famous for open source friendliness and hosts the largest amount (19.4M+) of open source projects is not open source. Bitbucket is not open source but upon buying the self-hosted version the full source code is provided with product customization options. What is the best place to discover public projects and connect with other developers? GitHub, GitLab, Bitbucket, and Coding both have public repository discovery functions and apart from GitLab each offers the ability to easily follow other users. Coding even lets you add customized tags to personal profiles, which helps to find and to connect with other users with a particular interest. Even though GitHub is not open source, it is still the hotbed of open source collaboration. It has by far the largest amount of public and open source projects and also hosts many of the most significant ones. (Docker, npm) With the early adoption of social features and with the free hosting of public projects, it is clearly a social hub for professional developers and everyone else who is interested in software development. What’s more, an exciting active GitHub profile could help you landing a great job. In more and more cases recruiters favor candidates with an active GitHub profile. When you are trying to decide which system to use, the ability to import and use your previous projects is critical. Bitbucket is in this sense stands out from the other three because this is the only one that supports Mercurial repositories. Coding, GitHub, and Bitbucket supports importing repos based on multiple different VCSs, GitLab on the other hand only supports Git. Git is the most popular VCS, but moving to GitLab could be complicated if you are using Mercurial or SVN repositories at the moment. GitLab’s repository importing feature explicitly geared to help users migrate from other more popular platforms. – The import of Git, SVN, HG, TFS. -Easy import from other services GitHub, Bitbucket, Google Code, Fogbugz. – The import of Git, SVN, HG. – The import of Git, CodePlex, Google Code, HG, SourceForge, SVN. All the 4 providers offer a free plan, but when we are looking at the details they have some significant differences. GitHub free plan allows you to host an unlimited number of public repositories with the ability to clone, fork and contribute to them. There is no limit on disk usage, however, projects should not exceed 1 GB and individual files 100 MB. If you are looking to host private projects for free you need to look at other providers. Bitbucket’s Small teams plan let’s 5 members to collaborate on an unlimited number of projects. Repositories here have a 1 GB soft size limit, when you reach this they will notify you by email, but your ability to push to the repository will only be suspended when your repo’s size reaches 2 GB. 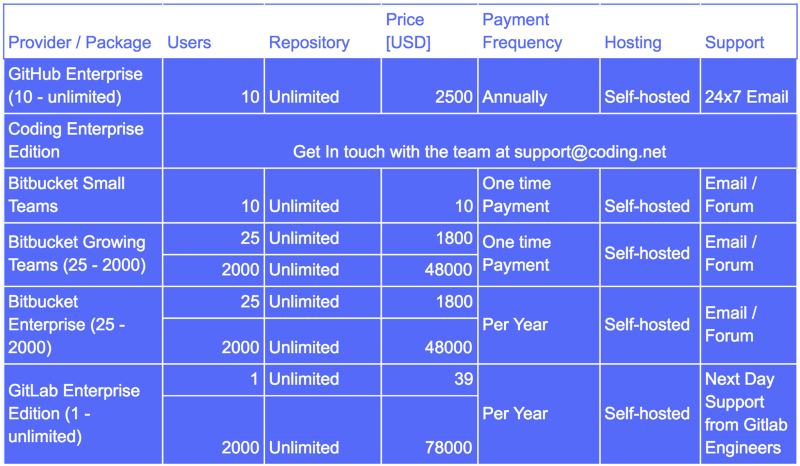 The free plan from Coding let’s 10 members to collaborate on an unlimited number of public and private repositories, but they impose a 1 GB overall storage limit which feels like a big restriction. If you are looking for a free cloud-based solution for private projects GitLab’s offer is probably the most appealing. GitLab Community Edition is the only self-hosted free plan on our list. This is definitely the best option for those who like to have full control over the code base and have the resources to maintain their own servers. The downside here is that it only comes with community support and some more advanced features as code search are not included. All the paid cloud-hosted plans offer an unlimited number of private repository storage and email support as well. GitHub personal account offers essentially the same functionalities as their free account with the ability to host an unlimited number of private repositories. There is no limit on how many users with a personal account can collaborate, but they can’t use organizational features such as team-based access permissions and billing is done independently. GitHub Organisation plan starts at $25 / month for 5 people and each additional user cost $9 / month. 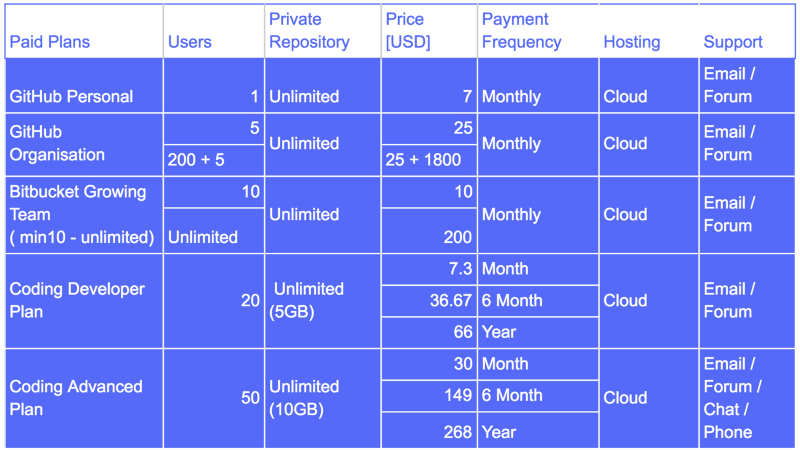 Bitbucket cloud-hosted Growing Team plan start with 10 users / $10 / month and for $100 / month it removes the limit on the number of team members. Coding is rather mysterious about their Enterprise edition, they don’t disclose any details of pricing and feature on their website. If you are considering their host their solution behind your firewall, you need to reach out to their team. They assess the client’s needs first and then they provide custom quotes based on the assessment. 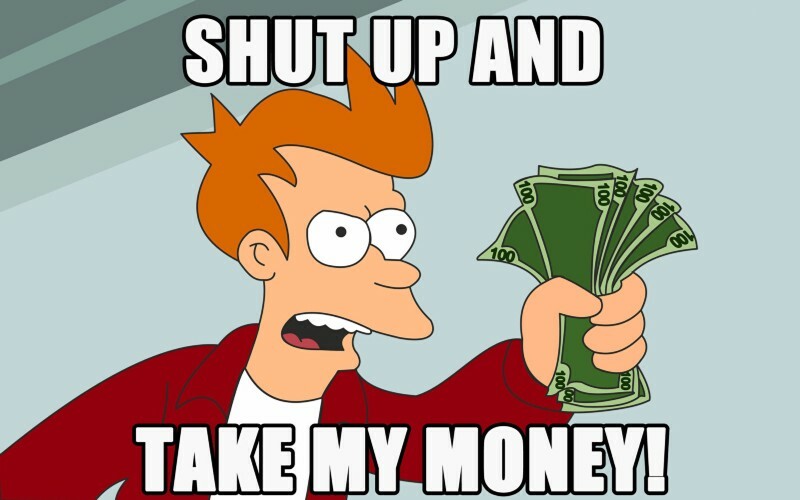 GitHub Enterprise plan starts at $2500 / 10 users and it’s billed annually. If you need more than that, which is likely to be the case, then you need to contact their sales team. Apart from your the servers at your own premises, GitHub Enterprise can also be deployed to AWS and Azure. One of the best thing about Bitbucket Small Teams and Growing Teams that they only need a one-time payment. Paying $10 for Bitbucket Small Teams once for all, definitely makes GitHub look expensive. The Bitbucket Enterprise version has a limit of 2000 users. If you need more than that we suggest that you should check out Bitbucket Data Center. GitHub, Bitbucket, GitLab, and Coding work seamlessly together with flow.ci. Connecting your either of your accounts to flow.ci only takes few steps. If you want an open source solution you should pick GitLab. If you are using other products from Atlassian (eg. : Confluence, Jira.. ), hosting your repositories on Bitbucket definitely make sense. If you are working on an open source project then GitHub is definitely a great choice. At this moment we would only recommend Coding for Chinese speaking teams since only their Web IDE has English UI. It is likely that one of the four repository hosting services can give you what you need. If it is not the case, then check out Assembla or CloudForge. flow.ci is a hosted continuous integration and delivery service, designed for teams who need a flexible and scalable solution but prefer not to maintain their own infrastructure. In flow.ci, development pipelines or automation workflows are simply called flows. In a flow, every step is a plugin that can be added by two clicks. You can add as many steps to your flow as you need, and there is no time limit on builds. What is really neat here is that My Component, the Function as Child Component can manage state on behalf of components it is composed with, without making demands on how that state is leveraged by its children. Lets move on to a more realistic example. Next lets design our API, we want a ratio provided in terms of X and Y axis which we will then use the current width to compute, lets set up some internal state to manage the width and height, whether or not we have even calculated that yet, along with some prop Types and default Props to be good citizens for people using our component. One does not simply learn to code. Because coding isn’t easy. Coding is hard. Everyone knows that. Anyone who’s scoured a stack trace — or git detached their head — can tell you that. Unfortunately, there are a lot of marketers out there trying to cash in on the notion that “coding is easy!” Or that it will be, if you use their product. And all that these marketers achieve in saying this is to make people feel dumb — sometimes taking their money in the process. The curse of knowledge prevents many experienced developers from being able to empathize with beginners. And nowhere is this lack of empathy more apparent than everyone’s favorite Google result: the coding tutorial. How many times have you actually been able to finish a random tutorial you found through Google, without getting derailed by some cryptic error or ambiguity? You’ll even have flashbacks of all those bad Hollywood hacking scenes where they make coding look so easy. Still, you’ll yearn for those l33+ h@x0r skills. You’ll feel impelled to vanquish bugs with nothing but your wits — and a gratuitous number of green-on-black monitors. Do you feel better? Are you laughing at the absurdity of our collective construct of software development? Now that we’ve gotten that out of our system, let’s talk about the most insidious word in the English language. There’s a good chance that if you encounter a word like “simply” in a tutorial, that tutorial will assume a lot about your prior knowledge. Maybe the author assumes that you’ve previously coded something similar and are just using their tutorial as a reference. Maybe the author wrote the tutorial with themselves in mind as their target audience. Either way, there’s a good chance that the tutorial will not be designed for someone at your exact level of coding skills. Well, we’ve got you covered. Albert Meija has created a Chrome extension that will detect the word “simply” in a tutorial and will pop up a notice that the tutorial isn’t designed for beginners. This Chrome Extension serves as a proverbial canary in the coal mine, notifying you of the presence of the word “simply” — and thus likely assumptions about your prior knowledge — before you get too far into the tutorial. But in the meantime, this simple extension may steer you clear of those ship-sinking “simply” icebergs out there in the chilly ocean that is learning to code. Until we meet again — stay strong and don’t believe the hype. Learning to code is hard. Tune out the noise, stick with it, and profit. Technical front-end interviews are difficult. That’s a fact. Not only do you need to have a solid grasp of computer science fundamentals, but also an understanding of things like web performance, build systems, and CSS layout engines. While there are resources out there, I’ve found that there are only a few complete guides for helping you prepare for a front-end interview. So I decided to write a topic by topic outline that will hopefully help you ace your next interview. Also, ask your recruiter for tips on what topics to focus on when preparing. The reason behind this is because in addition to front-end specific question, some companies will ask you traditional computer science questions about topics like searching and sorting algorithms. HTML and CSS is like the bread and butter of front-end development. During interviews, you will most likely be asked questions about the nuances of HTML and CSS. Also, be prepared to be asked to code up a layout based on a mockup. Just in case you need an HTML and CSS refresher, here are a few basic concepts to look over. In addition to these concepts, know about CSS preprocessors like SASS or LESS and their benefits. Also be familiar with CSS naming conventions like BEM and OOCSS. Another important point is that interviewers look for candidates who champion CSS best practices. As a good reference, this guide written by a front-end at Medium provides insight into how Medium iterated to their current CSS architecture. I mentioned earlier that some interviewers will ask you to recreate layouts in HTML and CSS. Practice doing so in a playground like CodePen. Check out Dribbble since it has lots of simple yet nice designs that would be fun to recreate. Finally, as front-ends, we are so used to making changes in our editor and then verifying the change in our browser. Often times during interviews, you won’t have this luxury. When you’re preparing for your interview, try code most of your layout without looking at the result till the end. Some companies hire software engineers before front-end developers. What this means is that these companies expect you to be well grounded in topics like good software design principles, scalable code architecture, and testing. If your recruiter suggests you review your knowledge of data structures and algorithms, this section is for you. Otherwise, feel free to skip this section. If you don’t have a computer science background, that’s okay. Most of these concepts are pretty straightforward to learn. Note: For graphs, also know how to implement depth-first and breadth-first search traversals. I know it’s a lot of material to take in, especially if you’re new to front-end development. Start preparing for your interview ahead of time, so you can move at a comfortable pace. Also, remember that interviews are not a measure of your worth as a programmer. Some people are good at interviews, other are not. Sometimes you click with your interviewer, other times you don’t. If you have any questions, feel free to leave a note or Tweet out to me. I would also love to know how your interview experience went. Good luck! P.S. If you liked this article, it would mean a lot if you hit the recommend button or share with friends. This article is now available in Japanese and Chinese. When it makes sense to use TypeScript When you have a large codebase When your codebase is huge, and more than one person works on the project, a type system can help you avoid a lot of common errors. This is especially true for single-page applications. Any time one developer could introduce breaking changes, it’s generally good to have some sort of safety mechanism. The TypeScript transpiler reveals the most obvious mistakes — though it won’t magically eliminate the need for debugging. In my company, we had a team of C# developers who were coding a sophisticated desktop application in C# and WPF (which is basically a front end development tool for the desktop world). They were then asked to join a web project as full stack developers. So in short order, they were able to learn TypeScript for the front end, then leverage their C# knowledge for the back end. TypeScript can serve as a replacement for Babel The old Microsoft used to take standard tools — Java for example — and add proprietary non-standard features to them — in this case resulting in J++. Then they would try to force developers to choose between the two. Though it’s is a less-common use case, it’s technically possible to transpile ES6 code into ES5 using the TypeScript transpiler. This is possible because ES6 is essentially a subset of TypeScript, and the TypeScript transpiler generates ES5 code. Also, TypeScript has some cool features that are not in ES6, like enums and the ability to initialize member variables in a constructor. I’m not a big fan of inheritance, but I find it useful to have the public, private, protected, and abstract keywords in classes. TypeScript has them and ES6 doesn’t. Our C# developers thought it was super amazing to be able to write a lambda function as the body of a method — which eliminated the headaches associated with the this keyword. When a library or framework recommends TypeScript If you are using Angular 2 or another library that recommends TypeScript, go for it. Take a look at what these developers have to say after using Angular 2 for six months. if(typeof name !== ‘string) throw ‘Name should be string’ With TypeScript, we could eliminate a lot of these type checks all together. This especially showed its effect in parts of the code where we previously had a performance bottleneck, because we were able to skip a lot of unnecessary runtime type checking. So when are you better off without Typescript? When you can’t afford an extra transpilation tax There are no plans to support TypeScript natively in the browsers. Chrome did some experiment, but later cancelled support. I suspect this has something to do with unnecessary runtime overhead. If someone wants training wheels, they can install them. But bikes shouldn’t come with permanent training wheels. This means that you will always have to transpile your TypeScript code before running it in a browser. For standard ES6, it’s a whole different story. When ES6 is supported by most browsers, the current ES6 to ES5 transpilation will become unnecessary (update: yes indeed!). Without transpilation, you just modify the file and refresh your browser. That’s it. No watching, transpiling on demand, or build system are necessary. When you want to avoid weird debugging edge cases Sourcemaps make it easier to debug Typescript, but the status quo is not perfect. There are really annoying and confusing edge cases. Also, there are some problems debugging the “this” keyword and properties attached to it (hint: “_this” works in most cases). That is because Sourcemaps currently don’t have a good support for variables — though this may change in the future. The TypeScript transpiler (just like Babel) has features that require generating extra code (inheritance, enum, generics, async/await, etc). No matter how good your transpiler is, it can’t surpass the optimizations of a good programmer. So we decided to keep it in plain ES5 for ease of debug and deployment (no transpilation whatsoever). That being said, the performance penalty is probably negligible compared to benefits of a type system and more modern syntax for most projects. But there are cases where milliseconds and even microseconds matter, and in those cases transpilation of any kind is not recommended (even with Babel, CoffeeScript, Dart, etc.). 1 It’s fully compatible with ES6. It is really nice seeing Microsoft playing fair with the other browsers. Our ecosystem can benefit from a strong rival to Google, Mozilla, and Apple. Microsoft is spending serious energy on it — such as writing Visual Studio Code from scratch using TypeScript on Google Chrome, of all platforms. Typescript is not the answer for everything. You can still write terrible code in it. TypeScript haters are gonna hate, either because of fear of change or because they know somebody who knows somebody who is afraid of it. Life goes on and TypeScript introduces new features to its community anyway. But like React, TypeScript is one of those influential technologies that is pushing the boundaries of our web development. Here is a quick tutorial, and a very nice guide, but I’m more a language-reference kinda guy. If you like video, here’s a course from Udemy. John Papa has a a short article about ES5 and TypeScript. There’s an interesting study that shows all things equal, a type system reduces bugs by 15%. Oh, and if you feel like going on a side mission, read why programming is the best job ever. Unlike some other Cross hatchbacks of its segment, the Honda WR-V gets some significant updates which has helped it get an entirely new identity. Towards the front, the WR-V features a raised bonnet while the thick chrome grille somehow reminds us of the new City. Besides the revised hood and grille the headlamp cluster too has been redesigned as well and also gets integrated LED daytime running lamps. To make the Crossover slightly beefier the WRV also features a sculpted bumper which also houses round shaped fog lamps. There are also silver finished scuff plates. Just like the front profiles the side profile too features larger 16-inch wheels wrapped with 195/60 profile tyres.Just like the front and side profile the rear profile too has been heavily modified as well as it gets different appearing L-shaped taillamps. The rear bumper too has been amended as well along with new bumpers and slightly modified tailgate.